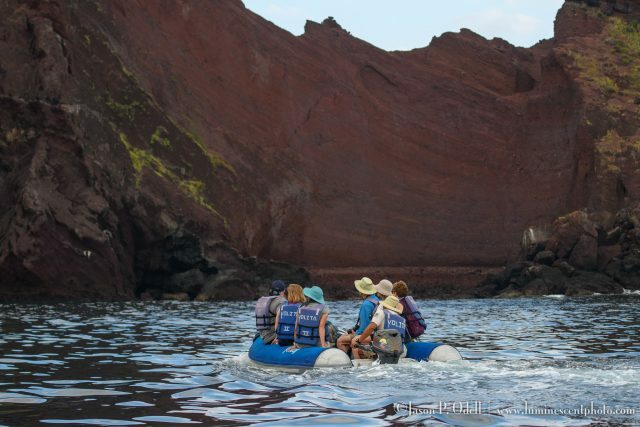 Every day, we typically had two land excursions and one or more snorkeling excursions. The land excursions were classified as “wet” or “dry” landings, but they were always by panga and only once involved a dock (the town of Puerto Villamil on Isla Isabella). In fact, the only real difference between wet and dry landings was whether or not you put your feet directly into the water. The wet landings were actually easier in my opinion because all you had to do was turn around and put your feet into the water (usually 2’ or less) and get off the panga. Dry landings were sometimes tricky, as you often had to step up onto rocks or steps, and they could be slippery. Fortunately, the tour guide and crew were extremely helpful to make sure everyone exited the pangas safely. A crew member was always there to hold your hand and stabilize you while boarding or exiting the panga. Although the Galápagos islands lie 600 miles off the coast of Ecuador in the Pacific, they straddle the equator. The weather is hot and sunny almost year-round. We were there in the warmest month (March), and temperatures were in the mid to upper 80’s (F) and it was very humid. The sun is always overhead, so proper UV protection is critical. Clothing that has UPF fabric is ideal, as is a wide-brimmed hat and sunscreen. Bring plenty of sunscreen, because it is extremely expensive to purchase (assuming you even find a store) in the Galápagos. You’ll definitely want to bring a bathing suit if your tour includes snorkeling trips. Sandals or flip-flops to wear on the boat, separate from your other shoes. Every time we returned from an excursion, the crew washed our shoes with a hose on the stern of the ship. We were then directed to keep our “shore” shoes in a bin at the back of the boat. The whole idea was to not only minimize sand and dirt on the boat, but also reduce any cross-contamination between islands. I used a pair of closed-toed water shoes (Chaco) with a hiking shoe sole and they were great, even when hiking on fairly rough terrain. When we had dry landings, I usually wore my hiking shoes. Having good hiking shoes was important when we were hiking on the lava fields of Bartolomé island and trekking to the top of Sierra Negra volcano on Isla Isabella, where sturdy and dry footwear was critical. I packed lightweight, wicking t-shirts that I could rinse out and hang to dry on the top deck of our boat. The boat had some clotheslines and quick-drying clothing worked great. When the sun was out, my shirts dried in just a few hours.